A whole lot of chaos has ensued on the islands of Isla Sorna and Isla Nublar. Since 1993 we've seen two state-of-the-art theme parks abruptly go defunct and two rescue missions disastrously unfold on these isolated chunks of land. The crazy thing is, we relish in the spectacle that results from these unfortunate events. When dinosaurs treat humans as supper and remove man from the top of the food chain, we're all about it. But what about reliving those tense, chilling moments through a family-friendly, lighthearted filter? That's the type of experience that LEGO Jurassic World brings to the table, and the question is whether or not that edge-of-your-seat carnage translates well into brick form. It's best to think of LEGO Jurassic World as an anthology that's made up of four separate games, each based on a Jurassic Park film; Jurassic Park, The Lost World: Jurassic Park, Jurassic Park III, and Jurassic World are all here, and these LEGO-ized re-enactments follow all the major plot beats from their respective films. Each game is made up of its own story missions and its own island area with optional puzzles and activities to seek out between missions. However, instead of taking a true open-world approach like LEGO Marvel Super Heroes or LEGO Batman 2, the format is slightly different. As opposed to freely roaming in any direction over a massive area of land, the environment is more or less a singular pathway or road that leads around the park or island, either back to where you started or to a final destination. You'll be limited in where you can travel at first, but story progress and unlocked characters will open things up in time. This structure means that backtracking is part of the routine when you want to return to puzzles or areas that you couldn't previously access. So, in a way, it almost feels pointless to explore until every one of the games has been completed and all character types have been obtained. All in all, this aspect of the game is underwhelming, and even though it will extend the value for anyone that likes to milk their purchases for all they're worth, it's not designed in a way that ensures it will appeal to or satisfy everyone. 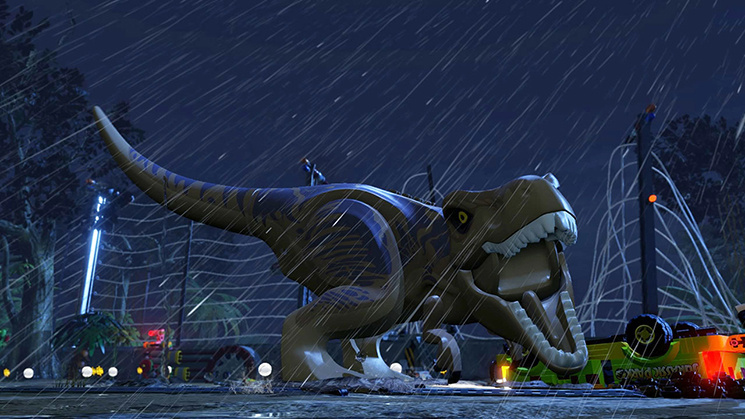 But the real star of the show comes in the form of story missions, which place players in the most memorable scenes from each of the Jurassic Park films. 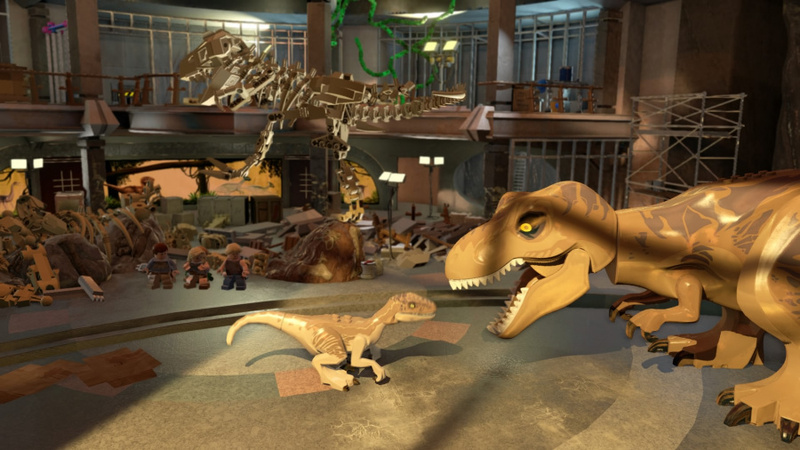 Progressing through these scenes is about utilizing the various characters – human and dinosaur – and their unique abilities to solve environmental puzzles and evade danger. 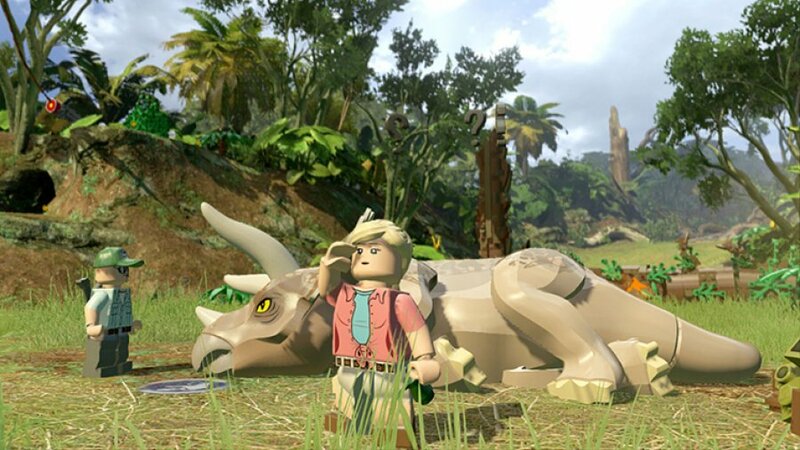 It's the typical LEGO formula, and it serves its purpose and functions well enough, but there's no real evolution or ingenuity to be found; gameplay is exactly what we've come to expect of the LEGO series, with very few surprises. Thankfully, a herd of the missions are designed expertly, and they prove why such a prolific series has stayed relevant all these years. But there are also numerous missions that fall flat, relying too heavily on unneeded combat or working too many playable characters into the mix. The campaign is a bumpy ride to be sure, though it's nowhere near being classified a disaster. The events of the Jurassic Park films have been spoofed/recreated in both cinematics and gameplay sequences, and they're generally charming, if sometimes a bit too corny for their own good. 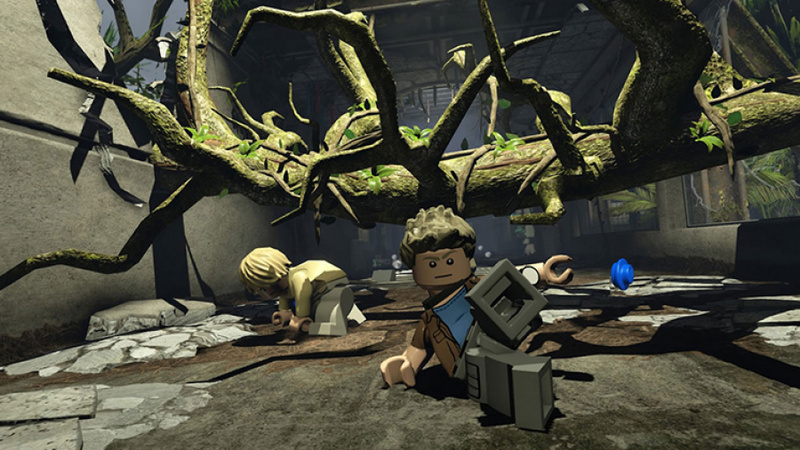 Reliving this classic series in video game form will no doubt be the foremost reason to visit LEGO Jurassic World, and we'd say the game mostly delivers in this regard. Keep in mind that the gags are positioned to amuse children more than adults, so don't be surprised if your kids or younger siblings end up more satisfied than you in the end. That's not to say that there's not an enjoyable all-ages ride along the way; it's just that the humour often comes in the form of random visual gags that don't always make the best use of the scene they're based upon. Parents will be happy to know that the carnivorous violence that the films are known for has been greatly subdued. The iconic death scenes – like Dennis Nedry getting mauled by the dilophosaurus or the unlikeable lawyer getting eaten off the toilet – are now devoid of death, and a majority of the dinosaur aggression in general is offset by some sort of daft occurrence. There's still some intensity here and there, but it's been handled rather well by the developer. As is the case with most LEGO games, there's drop-in/drop-out cooperative play available at the press of a button. We think LEGO games are at their best when teamed up with a partner, and that sentiment applies to LEGO Jurassic World as well. Thanks to the Wii U GamePad, both players are able to have their own screen, which is much better than dividing a wide television across its Y-axis. If you're engaging solo, however, the GamePad can be used for off-screen play. Sadly, there is some turbulence that tends to cheapen the overall presentation. First off, the dialogue is made up of audio clips ripped directly from the original films, and the poor quality of these clips and their contrast with the music and sound effects make them hugely jarring in certain games – the original Jurassic Park being the worst. If the clips were extracted from the isolated vocal tracks and worked into the mix without much compression, it might have been fine. But considering there's a bunch of fuzz and noise bleeding in, it can really sound like a rough mess. When all aforementioned shortcomings are bundled with a small number of bugs, the result is a game that suffers to give the impression that no expense was spared. But that doesn't mean it's not a decent game. For the biggest fans of Jurassic Park and the LEGO franchise, this might be an attraction worth visiting; it's probably best to wait for the inevitable price drop before investing in a ticket, though. For everyone else, we recommend holding off to see how LEGO Dimensions fares when it releases this September. 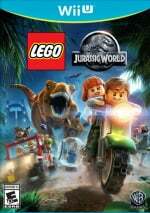 LEGO Jurassic World has been birthed from the same DNA that the LEGO series has been reliant on for quite some time, and it's doubtful that anyone will be truly awestruck by its attractions. But that doesn't necessarily mean the adventure's not worth embarking upon. 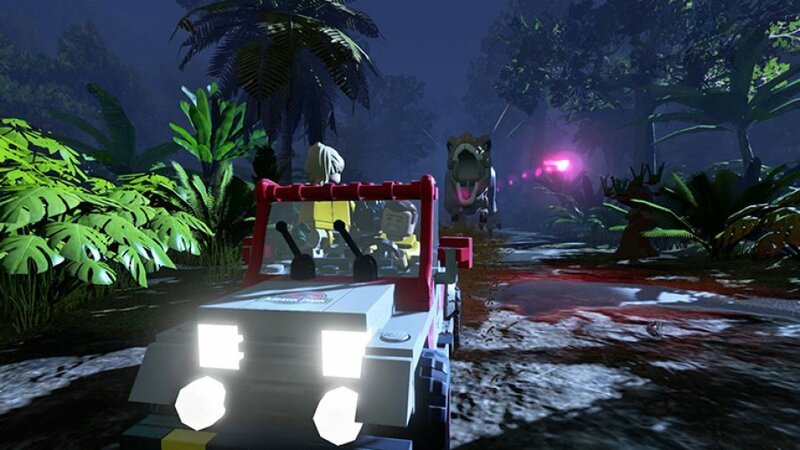 Reliving the Jurassic Park films in such a playful manner helps to offset the gameplay and technical disappointments, and the trip down memory lane will likely be enough to keep the biggest dinosaur fans entertained from start to finish. The park can be amusing, but it lacks its usual bite. Anyway, I was expecting a higher score... so I am not so excited about getting it anymore. The main issue I've had is the framerate Overal it's a fun game, as a JP fan! I know my plan is to wait the 6-7 months for this to drop to $20 and then I'll buy it. I don't plan on buying any more LEGO games. I played Star Wars 2, Star Wars Complete Saga, and the first Batman and they were way too samey. Oh boy. That's not what I wanted to read. Don't get me wrong. I don't plan to buy this game. But I guess it will be the same with LEGO Dimensions this fall. Framerate problems, probably longer loading times, some freezes and bugs. The quality of the LEGO games became worse the last few years. @ekreig All of them use the same formula, but you might want to check out the newer ones like Marvel Superheroes or Lord of the Rings that use the open world and have a few unique ideas. Plus if you have a Wii U Lego City Undercover is one you should look into. @sinalefa Thanks again. Getting warmer. My kid wants this to play as the dinos. W/ both Lego D and Lego Avengers coming out this fall this will be cheap quick. Every Lego game except LOU gets cheap quick. I'm also hopeing this was a rush job movie tie-in and Lego D has the 1st team working on it. May skip Avengers, kids just played Lego marvel and Disney Infinity, that's enough super heroes for awhile. @Mona-Reggie It's "Shoot HER! SHOOT HER!" The license is interesting this time. But still..., waiting for Lego City Undercover 2. If I buy this I might wait for when it is down to $20. @manwithoutfear Unfortunately I do not have a Wii U, but I've heard nothing but killer things about Lego City.Undercover. Now that one DOES seem like a good progression for the series. Co-op is exactly the same as Marvel Superheroes and Batman 3 - same bad frame rate, glitches, and bad design. Sometimes the second player can get stuck doing nothing for five or ten minutes while the other player solves puzzles. Thanks for the review. There are hardly any reviews for this game out there so I waited...guess I'll wait a bit longer and go with Lego Dimensions. I'll probably get this in a few months, for PC. Lego is pretty generous with discounts about 4-5 months after release. Besides, I got Lego Batman 3 in the last Steam summer sale (with all DLC, no less). I need to 100% that first. That score is way to low, its a really fun game. I would give it an 8 out of 10. One think I hate about Lego games is when freeroaming there no reaction of surrounding cpu's. I Use have the Lego marvel game before traded it in and I thought it be so cool run around as hulk causing chao! However none of habitats of the city reacted to me at all just same one liners. Which doesn't make feel like in breathing living city. Thats probably why wouldn't buy this running around as t rex should be awesome scarying and earing all the people on island etc. however I've seen in a lot of playthroughs that there is zero reaction from any of cpu characters. Imagine GTA or watchdogs for example had all standard free roam stuff but every single cpu character acted like you weren't there! It ruin your immersion in game world. I think you should realise the responsibility you face on these reviews and how they can affect peoples decisions to buy, this is actually more damaging in most cases to the system than good and it will mean peeps will stop developing for nintendo consoles if the bar is set so high against 1st party software. "the dialogue is made up of audio clips ripped directly from the original films, and the poor quality of these clips and their contrast with the music and sound effects make them hugely jarring in certain games"
I don't know about the other ones but my country doesn't have this problem since they hired voice actors instead of re-using voice clips form the italian dub. I got the 3DS version, it's really fun. It's too bad that the game has been getting average to to below average scores from sites because they didn't add anything too new to the Lego formula. I can't help but think this game would have probably gotten 8s, 9s, if it had come out earlier. These are hard to figure. The main difference was the animations. Building and fighting in Marvel both chugged, looking and feeling terrible. I was amazed they were by the same company. I'm certain there are multiple LEGO game teams. The one that makes things like LEGO City on WiiU is one I want to buy games from. The one that made LEGO Marvel I want to avoid like the plague. I'm super excited by this LEGO release. I've played through nearly every LEGO game from the beginning (in my opinion the Star Wars compilation is still the high point of the series). However, since LEGO Marvel I'm very wary...especially when reviewers don't mention the games in relation to each other on the technical level. How does this compare animation, fighting and building wise compared to the other LEGO games? Clean and quick or sluggish-feeling and "something off?" I was beginning to think there was something wrong with my copy or console. Glad I'm not the only one with an erratic frame rate. It's not unplayable, but it's noticeable enough to detract from the experience. I found it a bit disappointing after Lego Marvel, which seems smoother. It's still fun though. And yeah, the frame rate takes a hit if you split into coop on the game pad. Strangely, it's not as bad if it's splitting the big screen. Now this game is one big pile of crap. I haven't noticed the framerate issues and I've been playing in co-op. Only real issues are glitches, like getting stuck in place. I've had that happen on a few of the story levels. Wish it was more open world.."If there is one thing the history of evolution has taught us it's that life will not be contained." If I cared about the Jurassic Park franchise, I wouldn't be offput by the hub design. The open world in "Lego Batman 2" was poorly implemented, and it has terrible flying controls (although the rest of the game is still great). The glitches and framerate issues on the other hand, yes that's concerning. Is it possible the Lego games peaked around the time of Batman 2, LOTR, and Lego City Undercover? I'm just not sure any of the newer games have topped those 2012ish era ones. I've been playing through the 3ds version this past week. On the bus mainly. I like it, but it's missing large chunks of the main bits from the film. Pity about Jurassic World not being up to scratch on WiiU but can't win everything.